Susie Spurgeon was an amazing woman of faith, wife, Mom, author, and more. We can learn a lot from her! 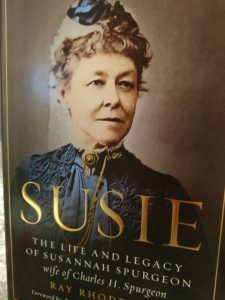 Susie: The Life and Legacy of Susannah Spurgeon (Rhodes, 2018) deserves to make your reading list for at least two reasons. First, it’s a fascinating historical account of a mighty woman of faith in Victorian England. Second, the book provides us with a terrific Titus 2 role model. Titus 2 holds great relationship truth. Included among its truths, Titus 2:3-4 directs older women to live well and to teach others, especially younger women, to live well. Writing around AD 63, the Apostle Paul knew how important women are in the success of their families and in the encouragement of other women. Susannah (Susie) Spurgeon lived a Titus 2 life. Among her many selfless accomplishments, she was instrumental in her husband, Charles Spurgeon’s famed preaching ministry. She ministered to countless others through her charitable giving. As part of her ministry, she distributed some 200,000 free books to poor, uneducated pastors to better equip them for ministry. Additionally, Susie was a highly regarded author in her own right, credited with five books and numerous other works. And what’s even more amazing is that she did much of this while chronically ill. Why? Because she loved her husband dearly and loved serving the Lord, her family, and her community. No matter the challenges she faced, she faithfully and enthusiastically pressed on. Older women may be inspired by Susie to improve their mentoring and support of younger women or other people in general. Younger women may find in Susie an example they would like to emulate. Women who feel stifled in their ministry to their family or to others may be encouraged to push through challenges they face. Readers will enjoy learning from this amazing woman of faith who left an incredible legacy. With Christmas just around the corner, consider buying Susie: The Life and Legacy of Susannah Spurgeon for yourself or for a woman or Church history buff in your family. Thank you Ray Rhodes Jr. and Moody Publishers for bringing Susie to us and giving her the credit she deserves. My Mama has been the most influential woman in my life. She has pushed through some major challenges across time and shown me what faith in action really looks like. Thank you, Mama! What about you? What woman in your life has made the greatest impact in your life? How? Encourage others by sharing your thoughts below in the comments section. I’ll do my best to get those posted as quickly as possible. If you think this article may be an encouragement to others, please consider sharing it via Facebook or Twitter (see below for sharing options). For more ideas and encouragement, “follow me” @drshannonwarden (Facebook, Twitter, & Instagram). And, sign up to receive my Hope to Build On blog by email. Don’t worry! You’ll see that I only blog about once or twice a month, so signing up for emails won’t inundate your inbox. Scripture references in this article are from the New American Standard Bible and linked to www.Biblegateway.com.